Did KFC Serve a Man Fried Rat? Remember how exciting it was to find the surprise in your Cracker Jack box? This is just like that, except mixed with the greatest nightmare you could ever dream of, which you would not even wish upon your worst enemy. Ooo, fun twist! California security guard Devorise Dixon says he ordered a three-piece box of chicken tenders at an LA KFC, and found that what he was eating was not chicken at all. Speaking on local radio show, The Randy Economy show, Dixon said, "It was very nasty. I spit it out. I look down at my hand and I realized that it was in the shape of a rat with a tail and everything in it." 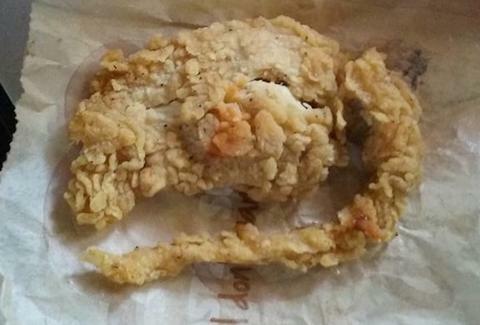 Dixon posted images of the "fried rat" on his Facebook page, and claims that when he returned to KFC "the manager actually freaked out too, confirmed that it was a rat. She apologized for it. They actually just offered me a free meal." Ah, yes, please bring on more mystery fried animals! Once was not enough!! KFC said on its Facebook page, "KFC takes customer claims very seriously, and we are continuing to investigate this matter. Our chicken tenders often vary in size and shape, and we currently have no evidence to support this claim. We are aggressively trying to reach Mr. Dixon, and we request that he return to the restaurant with the product for testing, or call us at 1-800-Call-KFC." Dixon claims on Facebook that he'll be getting a lawyer, but KFC told CNN, "We have made various attempts to contact him but he is refusing to either talk to us personally or through a lawyer... nor has he come forth with the chicken piece in question for verification." If you need a good reason to quit fast food, lean into this. But, really, it's probably just an oddly shaped chicken tender. Imgur user smilingturtle points to a flipped over photo of the "fried rat," where you can see Dixon's bite mark, and notes that it is "where the skull, brain, teeth & eyes would be on a rat." And, of course, all of those things are missing. The same user also posted photos of actual fried rats for comparison, if you're interested in really making your day worse. Our greatest apologies if you were planning on having fried chicken for lunch today. Update: It was chicken. Obviously. Lucy Meilus is a staff writer for Thrillist. She is deathly afraid of rats and this was the hardest thing she's ever had to write. Praise her on Twitter at @Lucymeilus and send news tips to news@thrillist.com.